Both the men’s and women’s soccer teams were defeated by the Marian Knights last Saturday. The women lost 3-0 and the men 1-0. The women’s team hosted the 17th ranked Knights at the John Ingold Athletic Complex over the Homecoming Weekend. The match was scheduled for 2 p.m. but was moved up for a 1:30 kickoff due to threatening thunderstorms. Marian came out with an attacking mindset, taking five shots during the first 10 minutes. They would add another 15 in the first half to make a total of 20, compared to Goshen who was unable to attempt a single first-half shot. In the 15th minute of the game, the ball was played from the right side of Goshen’s 6-yard box. Marian’s Courtney Denney slide in and tapped the ball into the net to put the Knights up 1-0. Denney would add to her first goal just four minutes later after the ball was once again played in from the right side. This time she volleyed the ball into the back of the net. Marian’s third and final goal came after another four minutes of play, this time off of the foot of Mackenzie Hall. Marian would maintain that 3-0 lead going into the half. Goshen’s Katie Baer turned away eight first-half shots from the Knights. During the second half, Goshen was able to hold the Knights off of the scoreboard who took 10 shots on goal. The Maple Leafs were able to muster three shot attempts, one piece from Taliah Borom, Lauren Cernak and Bella Larsen. Cernak’s attempt was the closest for the Maple Leafs and was their only shot on goal. Baer finished the game with 12 saves, and center back Carolina Villalobos Palacios blocked three shots. 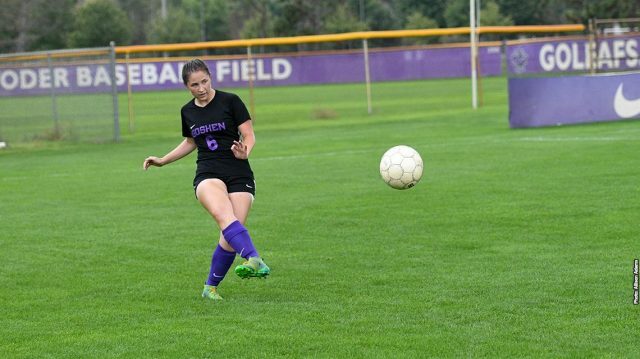 With the loss, Goshen College’s record falls to 4-5-2 overall and 0-4 in the conference. The men’s game followed later on in the night as they traveled to Indianapolis. The men had a weather delay of their own as their start time was pushed back to 7:50 p.m. due to the weather. The Maple Leafs, coming off of a 3-1 win over Taylor University, were looking to get above .500 in conference and to put themselves back in the top five of the crossroads league. The Knights would score their lone goal in the 18th minute off of a rebound volley sent in from 18 yards by Igor Ferreria. Ollie Smith and the Goshen College offensive attack responded with a shot on goal just 45 seconds later, but it was saved by Marian’s keeper Sidney Miranda, who finished the game with a total of seven saves. Goshen College attempted six first half shots, two more than the Knights. In the second half, the Maple Leafs searched for the equalizer, forcing Miranda to make five saves. Lucas Bontreger and Murray Cockburn would lead Goshen in shots with three a piece but the Leafs were unable to find the net. Marian outshot the Maple Leafs 7-6 in the second half and had six of the games eight corner kicks. Tomas Fonseca ended the game with five saves for the Maple Leafs but Marian took the 1-0 victory. With the loss, the Maple Leafs record drops to 6-6-1 overall and 1-2-1 in conference play. Both the men and womens teams are back in action this Wednesday, Oct, 10. The women’s team travel to Spring Arbor University to take on the number one ranked team in the nation, whilst the men’s team host the 21st ranked Cougars.